Cabrillo High School recently hosted Law Week on campus, organized by the Cabrillo Academy of Law and Justice (CAL-J). The week included speakers, exhibits and activities connected to public service and law-related careers. With this year marking the 50th anniversary of Martin Luther King, Jr.'s "I Have a Dream" speech, the week of events was connected to the themes of the civil rights leaders speech. Guest speakers and visitors included Long Beach Police Chief Jim McDonnell and Long Beach City Prosecutor Doug Haubert. CAL-J, one of Cabrillo's Small Learning Communities, aims to build knowledge, develop leadership skills, and uphold justice and integrity through integrated curriculum, work-based linked learning, relevant instruction and fieldwork experiences. 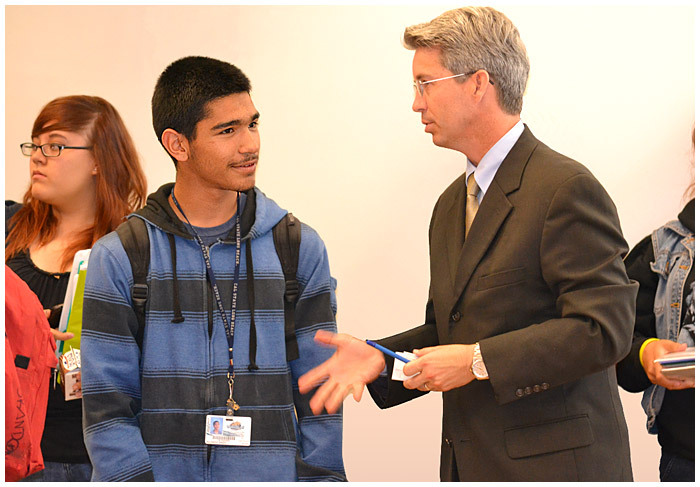 LAW WEEK – Cabrillo High School student Ricardo Razo talks with Long Beach City Prosecutor Doug Haubert during Law Week.